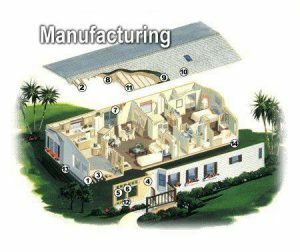 How well are manufactured homes made? How well is a mobile home constructed? How well built are the homes? Walden Woods South took on a hurricane and came out unscathed! The U.S. Department of Housing and Urban Development (HUD) regulates the construction of all our homes. In 1994, HUD updated the standards to provide for greater protection for mobile/manufactured homes from wind damage. During the severe hurricane seasons of 2004 and 2005, no mobile/manufactured home that was built according to these new standards sustained any significant structural damage from the storms! More information can be found here. 1. Wall Studs – Exterior wall studs are 16 inches on center of 2×4’s utilizing high grade lumber. 2. Roof Trusses – Double roof trusses – three feet from each roof end. Upgrades in spacing for Zone III construction. 3. Floor Joists – Sturdy 2 x 6 inch floor joists are crafted into every home for additional load requirements. 4. Exterior Wall Sheathing – Structural wall sheathing is 3/8 inch thick rated ‘sheathing’ or equivalent, increasing both strength and acoustical properties. 5. Window Headers – Headers above windows and passage doors insure solid construction. 6. Multiple Studs – Multiple studs at windows and doors accommodate the attachment of storm covers. 7. Sliding Door Headers – Headers above sliding glass doors add to the structural strength of your home, as does this multiple header and stud treatment. 8. Roof Sheathing – 7/16 inch thick rated sheathing fastened every 4 or 6 inches on center, depending on where it is located on the roof. 9. Shingle Underlayment – Lap joints and the entire perimeter of the roof are cemented. 10. Fiberglass Shingles – Three-tab fiberglass roof shingles are used for long-lasting beauty – and include a 20 year shingle manufacturer limited warranty. 11. Attic Insulation – Blown Insulation throughout the entire attic makes cooling and heating less expensive. 12. Wall Insulation – Keep fuel bills low with money-saving wall insulation on every side. 13. Column Uplift Straps – The center of the home has been strengthened 50% – 100% against uplift forces by adding more piers and anchoring devices. 14. Lag Bolts for Strength – Flooring to frame strength is secured with more lag bolts, and the number of anchor straps have significantly increased.